Internet browsing is something you just kind of take for granted. As a Mac user, it’s tempting to just use Safari and not look any further for your browsing needs. That comes with a few pros and a few gotchas, as anyone who’s used Safari for any length of time will tell you. But Safari has beautiful integration with iCloud which means that the links and bookmarks you save in Safari show up automatically in your iPad and iPhone. This is of course not so much of an issue if you don’t use iOS. 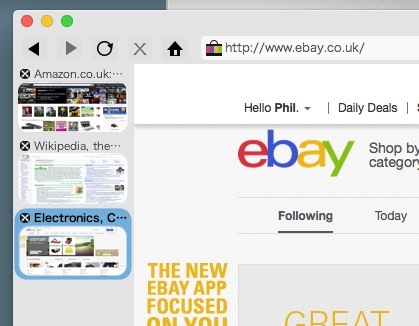 It’s also a fairly light and modern browser featuring tabs and all that other malarkey. But it is in some ways deficient, and often after a while you migrate to other browsers for greater compatibility and safety on the ever more complicated Web. Firefox is a good choice as it features good support for all the latest trends in web technology and even a ton of plugins to add functionality. Chrome is very well-served with plugins, too, and if your smartphone is an Android then you get the benefits of shared bookmarks through the cloud. If you have chosen and are happy with either of those two options, then you might not have looked much further afield. But other options do exist. A more recent contender for your browsing platform of choice is Roccat, part of a suite of software from Runecats. 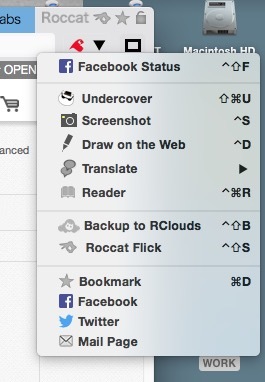 Installing the Roccat browser is simple; just follow this link and download. Once the DMG disk image has downloaded, double-click on it to mount the disk, and then drag the app icon into your Applications folder via the shortcut provided. and top right of the window. One of the first things you will notice when you start to use it is that Roccat comes with what it calls VisiTabs – each tab contains a little picture of the web page in it. It is a cool feature, and being able to locate the tabs at the side as well as the top of the page (where in our opinion are a little too big) is a good thing. 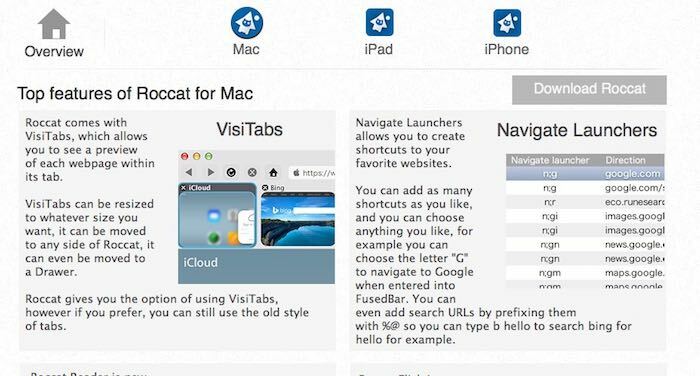 There is also a nice feature called Navigate Launchers which allows you to create shortcuts to your favorites. You can assign an often-used website to a single key for fast access. This is a cool feature, especially when you use some of the presets like “g” for Google, “gi” for Google Images and “y” for YouTube. For example, typing n;gi MakeTechEasier into Roccat will search Google Images for the term “MakeTechEasier.” This is actually one of the coolest parts of the system. Supposedly, Roccat’s built-in adware automatically removes 99% of webs adverts. This is true, but sometimes that can put you in a bind when you use a (mostly) benign site that has a lot of advertising like Facebook. The problem is that while most ad-blockers load the advert’s code and then block it, Roccat removes the adverts before they load which means quicker page loads, certainly, but sometimes also wonky formatting of the page. 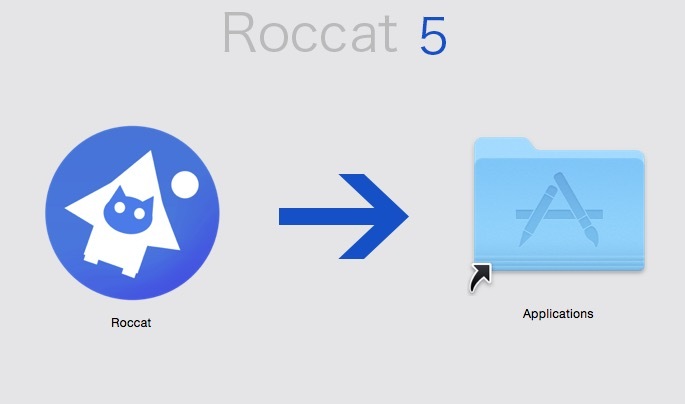 The browser features integration with the developer’s RClouds technology and sharing service Roccat Flick whereby you Flick pages at your friends. Roccat is fast, certainly, and small, and it seems to cope with the most common websites you would visit in a day. The formatting of pages seems to be a problem at times, but this might be from the brutal removal of advertising from the equation. Fascinatingly it seems to inherit the web cookies from your other browsers, as some sites seemed to recognise the user even though it was the first time they’d been there on this browser. It also seems solid and non-buggy, possibly as a factor of how small a piece of code it is. There is so much less to go wrong. The VisiTabs are an interesting innovation but take up far too much room if left at the top, in our opinion, especially on a smaller monitor. You can apparently turn them off if you don;t like them, but how to do this was not obvious. 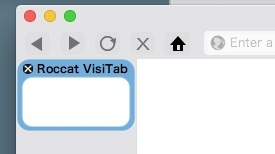 For reaching and grabbing a tab fast, having a visual representation of the window was quite handy, though, and if you have a lot of screen real estate you may enjoy this feature. If you have a small screen it might be annoying. That said, apart from the Visitabs, the rest of the browser is spartan and lean, and it makes for a very clean view of web pages with very little in the way of distracting clutter around the outside. It is innovative, different and a fresh take on what a browser should be, so is worth at least checking out to see if it could be your browser of choice. It’s fast, it’s light, it’s free, and it’s solid. We’re not sure it would replace Firefox as the browser of choice, but it’s certainly a viable alternative, especially for smaller lower-powered machines or older Macs. If you have any questions or observations about the Roccat browser, please let us know in the comments below.